Now this was a cool mini-series. Jonathan Hickman excels at taking gigantic, complex ideas, and playing around with them in his comics, sometimes crafting equally gigantic, complex storylines (most of his Marvel work falls into that category), although sometimes he instead delivers a tightly focused little series, like he has with The Red Wing. In this futuristic comic, the world is being attacked by a mysterious force that comes from the future. Their goal is to strip different eras of time bare of all resources, and so the good guys have created fighter vessels that can move through time as well as space. Picture a cross between Time Bandits and Battlestar Galactica, and you start to understand the background here. At the same time, as with many a good science fiction story, there is a family tied to the centre of things. Dom's father was a TAC pilot who was lost when Dom was a small child. This spurred him to become a pilot himself, and the hero of the series. As it turns out, his father wasn't lost, and instead hung out with some ancient Aztec or Inca for a while, before becoming a prisoner of the leader of the enemy forces. Dom, meanwhile in the future, has a hard time becoming the pilot he wants to be, and keeps turning to his General for support. This issue finishes the story of the father, and reveals a little more about their family, in a very Star Wars way. It's a great issue for action, and the emotional scenes are handled nicely. I don't know that I fully follow all of the future stuff - time travel and paradoxes make my head hurt, but I did appreciate the manner in which Hickman told his story, and I admire its scope. This book is a good companion to Hickman's superior Pax Romana , which is about a group of people moving back in time to guide human development. I want to close this review by commenting on how bummed out I was to learn this week that Hickman's one-shot, Feel Better Now, which he is drawing and which was supposed to come out this month, has been cancelled and will be solicited later as an original graphic novel. 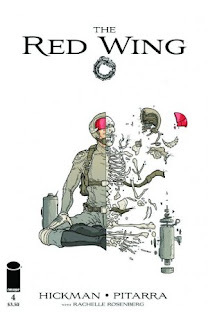 I was looking forward to seeing Hickman draw something again.